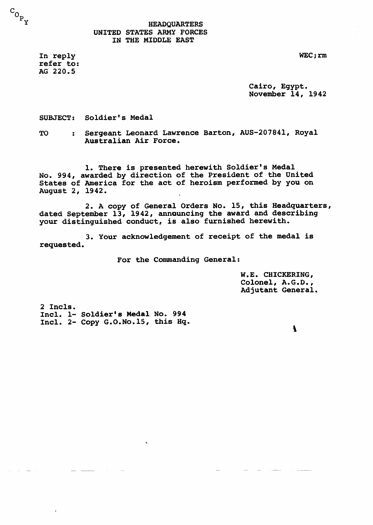 Leonard Laurence Barton was in the RAAF. He was assigned to HALPRO and the 1st Provisional Group. Leonard Laurence Barton enlisted in the Royal Australian Air Force (RAAF) in October 1939. He served on 458 Sqdn, 451 Sqdn, 450 Sqdn of RAAF, 1st Provisional Bomb Group of USAAF and 376 Bomb Group of USAAF. 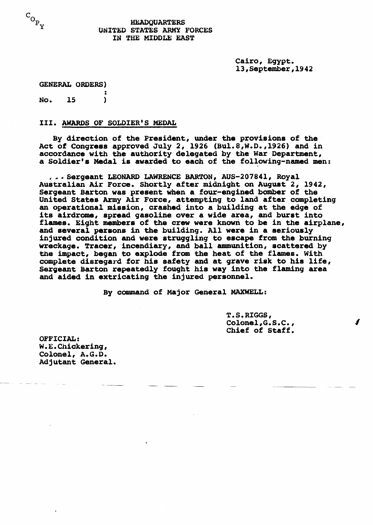 He was awarded the U.S. Soldier's Medal for Valour and twice commended for Meritorious Service. He was discharged from the Air Force 22nd October 1945. He spoke very little about the circumstances of him receiving the bravery award. I think it was quite a traumatic experience. I don't think he was acquainted with any of the personnel killed. From his service record, he arrived in Egypt 26.5.42 (May 26, 1942) and served in the Middle East until 21.5.44, (May 21, 1944) when he went to Italy. He served in Italy until 29.8.44 (August 29, 1944) when he returned to the Middle East. On 9.9.44 (September 9, 1944) he was repatriated to Australia because of the failing health of his mother. He spent the remainder of his time in the Air Force in Australia training recruits. 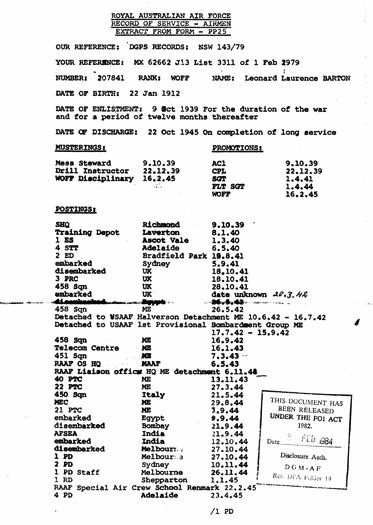 His service records show his date of birth as 22.1.12, but in fact he was born on 22.1.18. When he was underage he had joined the Merchant marines and had given a false D.O.B. My son Aaron has a photo of my Dad being presented with his Soldier's Medal and the actual medal. They are both framed along with his other Service Medals. Aaron is going to photograph these for you and I will send it as soon as I receive it - probably next weekend. My father died in 2002 aged 84. * The "plane crash" referred to occurred on August 2, 1942. 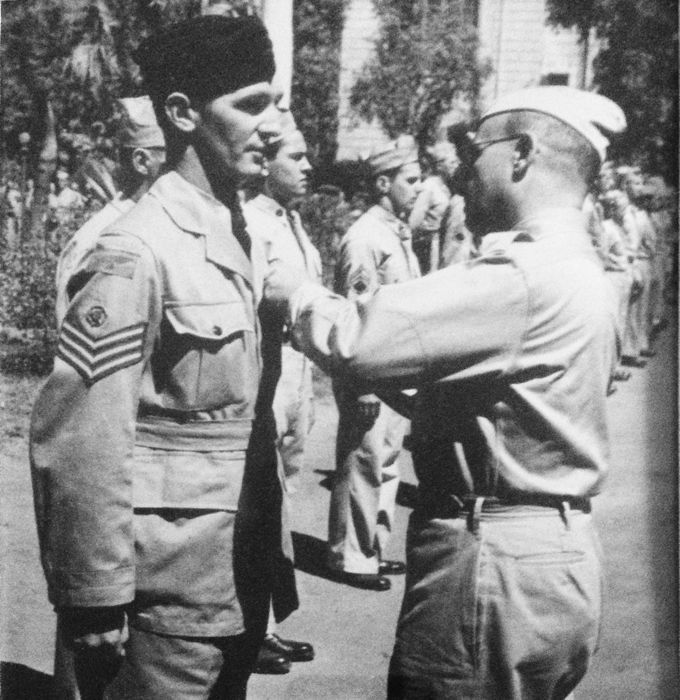 For his bravery, he was awarded a Soldiers medal by the USAAF.